This would be the point where I paste a link to the review I already wrote, but it hasn't been published yet. In that case, I'll do my best to summarize. 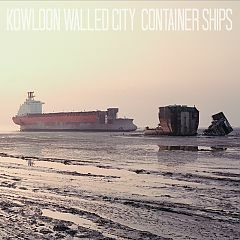 Container Ships (Brutal Panda) is a really heavy album. Its weight comes from both its tone and lyrical content. Huge, awe-inspiring riffs and lyrics you can relate to make this more than just a ship passing in the night. Yet, after talking with bassist Ian Miller and guitarist/vocalist Scott Evans, the size of the album has nothing to do with their egos. They are just four normal guys making the music that comes out of them. And the dirty doom rock that results just happens to be really, really good. The album is sonically immense, unassuming and to be honest, quite captivating. You could catch a ride in the wake of Container Ships, but I recommend getting right on board.